Have you ever entered your bedroom and felt like something vital was missing in the room? By this something we don’t mean a specific item (your glasses, maybe? ), or that one task you dimly recall you wanted to schedule in this morning (changing the linens, most likely) – we mean that elusive feeling of rightness every single one of us hopes for. Our bedrooms are our sanctuaries. At best they offer comfort, relax our minds, help us fall asleep just as much as welcome the new day with a smile, and more. And ideally, they do so by just feeling right. A good way to achieve this all-encompassing notion of rightness and relaxation, is via colour schemes. Deck out your bedroom in just the right combination of colours, and the room will be transformed. Colours can create magic – they soothe, energize, relax, and generally enfold you in a feeling of wellbeing. And so, why don’t you try and make your life run that much smoother, give yourself a bit more luxury and beauty? 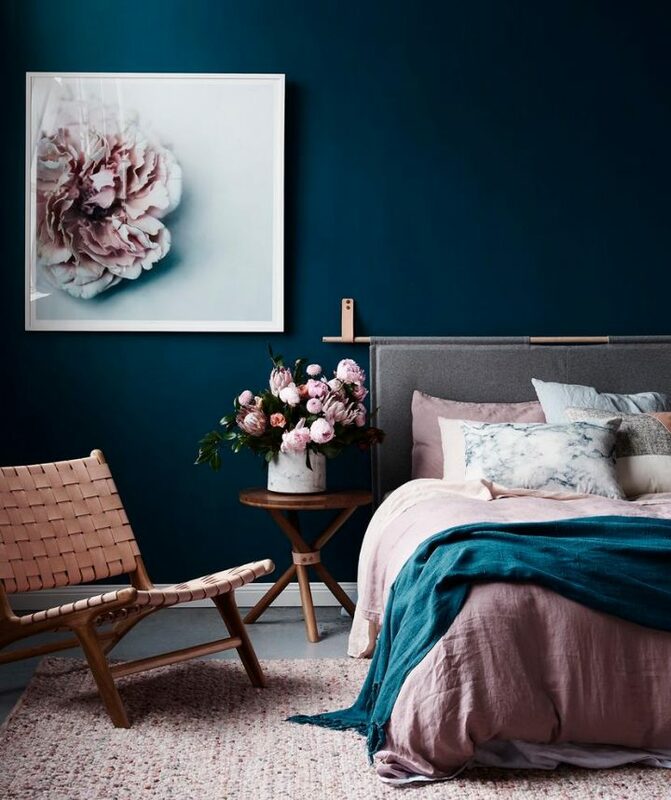 Discover the most beautiful bedroom colour schemes below, grab a paintbrush, and transform your experience! 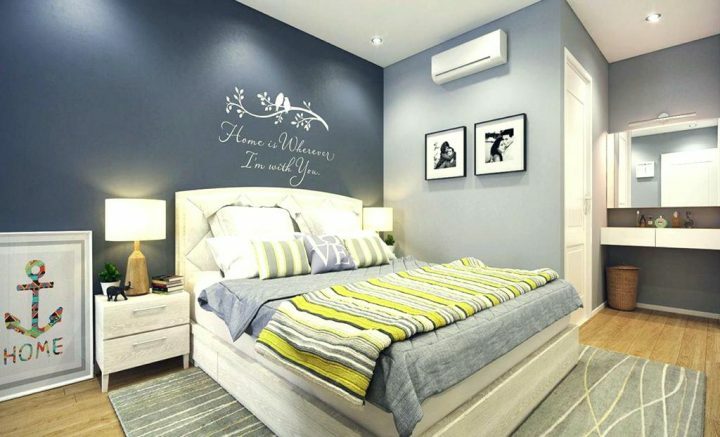 The dark grey walls give the room a soothing aura. The white ceiling and bed linens make sure that the room itself doesn’t look too dark. Both of the dominant colours are picked up again in the geometric-patterned rug, rounding out the design. Add in a few splashes of colour, in this case the red cushions and throw, as well as the leather headboard to artfully break the otherwise monochrome look and you have a inviting, relaxing bedroom you really want to curl up in. 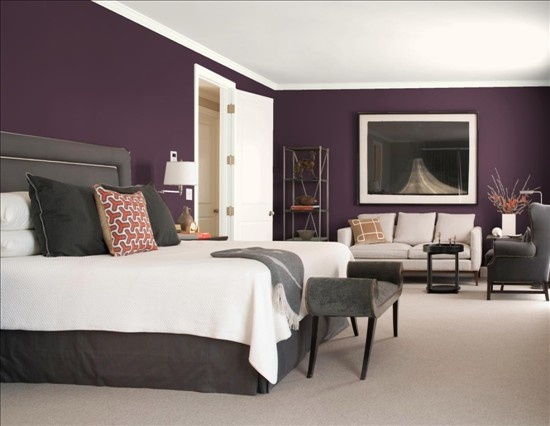 The dark purple walls here contrast nicely with the light beige carpet, ceiling, sofa and bed-linen. The dark grey armchair, bedframe, and bench at the foot of the bed round up the colour scheme, creating an overall feeling that just invites you to while away the hours in your bedroom. The combination of light blues and beige with white linen, wall borders and built-in bookshelf creates a wonderfully airy look that makes the bedroom a safe haven for its inhabitants. This colour-scheme is perfect to enhance relaxation while at the same time it is light enough to encourage a good morning. The combination of light, neutral hues and blonde woods is as timeless as it is effective. This colour-scheme effortlessly creates an airy atmosphere that invites the owner to stay for a while. Add in bare wood shelves, DIY pallet furniture, and very sparse decorations, and this combination is incredibly contemporary in its timelessness. Photo: Haverty Furniture Companies, Inc.
A combination of dark woods and light fabrics always works great. Add in the deep blue wall colour and you create a luxurious, elegant colour scheme that is appreciated by men and women alike. 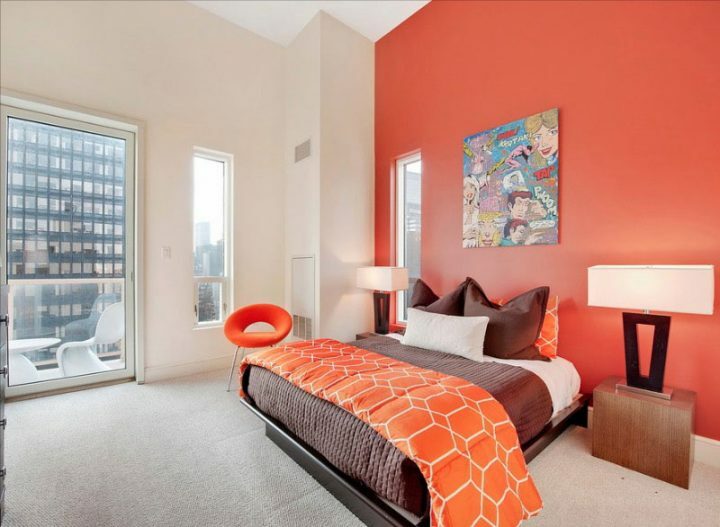 Bold colours, like orange, are a great way to liven up your bedroom and create an energizing atmosphere that makes getting up in the morning that more pleasurable. Bold colours, however, need to be used sparingly – one bright wall, and a few matching deco-elements are the way to go. 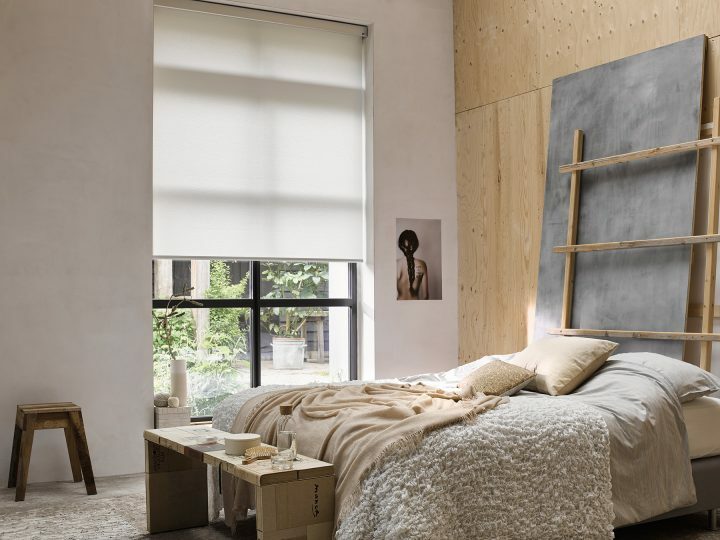 Counterbalance the vivid colour with clean, light hues of white and grey, to sooth the eye, and sprinkle in a few darker elements like bed-linen or bedframe to anchor the overall room design. This great combination of dark blue walls and beautifully light pink furniture, bed linen, and deco-elements like the shaggy rug create a lovely, romantic atmosphere that soothes the senses and invites to while away the hours. Combining various shades of grey – ranging from dark to very light, nearly white – is a surefire way to create a sophisticated, clean, and very soothing design. To prevent the room to feel too monochromatic, juxtapose the dominant colour scheme with flashes of colour, like the yellow-and-grey throw and cushions, and a natural wood floor. Have you found your favourite colour scheme? What colours are your bedroom, and which would you chose if you re-decorated the whole room right now? Let us know!